Meat processing facilities, such as the poultry industry, produce wastewater with heavy loads of fats, oils, grease and solids. Before sending that water down the sewer drain, pre-treatment is required to remove as much of these solids and oils as possible. Removing these contaminants is simple with the proper designed DAF system. 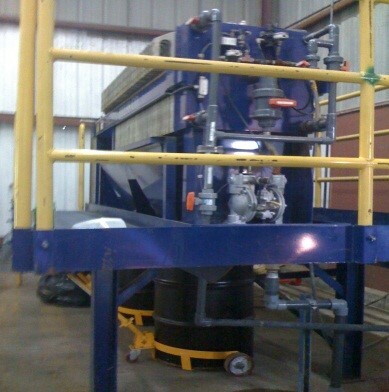 Yamada Pumps have been able to fill a “niche” in these systems, enabling better handling of the waste. What is a DAF system? Dissolved Air Flotation Systems (DAF) is a water treatment process that clarifies wastewater through the removal of suspended matter, such as, oil, greases or solids. The removal is achieved by dissolving air in the water or wastewater under pressure and then releasing the air at atmospheric pressure in a flotation tank or basin. The released air forms tiny bubbles which adhere to the suspended matter, casing the suspended matter to float to the surface of the water, where it may then be removed by a skimming device. Pumps for handling DAF sludge. 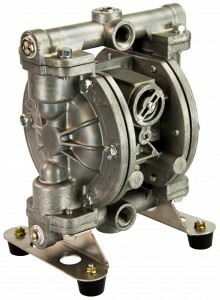 A multitude of positive displacement pumps have been used to transfer the DAF sludge; however, recently AODD (Air-Operated Double Diaphragm) pumps have become an option. Their ability to handle the viscous sludge and the ability to run dry without damage enables the pump to continue to run as the hopper empties. Conventional ball valve design AODD pumps (with bottom suction, top discharge) constructed in Aluminum with TPO or Buna N elastomers, were previously used. In poultry fresh (kill) plants, pieces of debris from the wash down would hang up the ball check valves, requiring regular tear down for cleaning. This would require the conventional AODD pump to be removed from service and completely tore down in order to clean out the ball check areas. Because the SolidPRO pump is designed to handle solids up to 2-inches and easy clean-out ports, it has quickly gained recognition as the preferred solids pump for DAF sludge. SolidPRO pump installed at a plant. 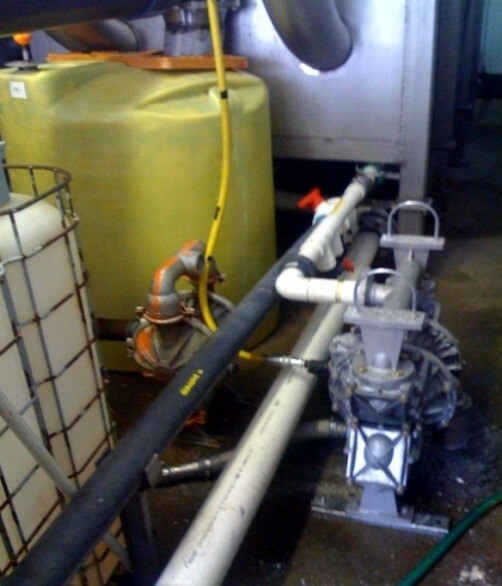 Watch the SolidPRO pump used at a chicken processing plant. The SolidPRO clean-out cover plates enable access to the flapper check valves for easy flushing or cleaning. 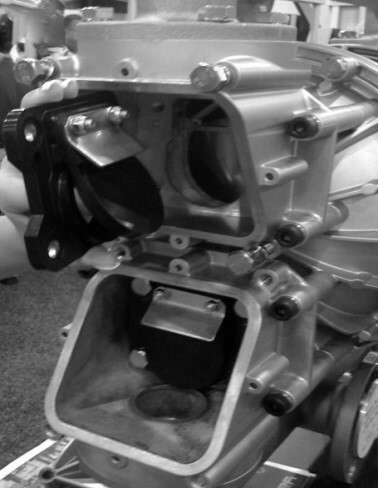 SolidPRO valve plates for easy access. SolidPRO valve plates for easy clean-out. Waste sludge from the DAF system that does not have suspended solids can be transferred to a “plate and frame” filter press. 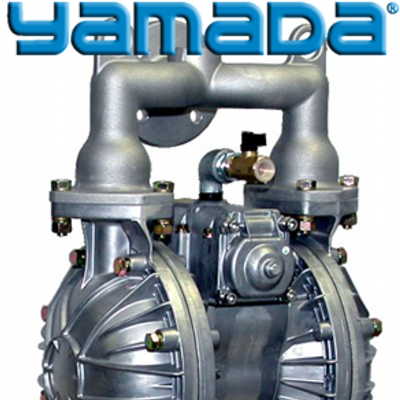 The Yamada pump is another perfect fit when compressing solids with minimal energy usage. Yamada pump used in a filter press. Yamada has quickly become the pump of choice within the poultry and meat processing industry. Either handling the sludge off the dissolved air flotation unit, compressing sludge in the filter press, or transferring solid laden sludges to be a transport carrier, there’s a Yamada pump to fit into any waste water DAF system. As laws and regulations change around the country, you may start hearing about CBD and other products related to the hemp and cannabis (burgeoning) industry. Out here in the West, we’ve seen a ton of activity from the CBD Oil business. Whether building extraction machines for resale or for the use in their own facility, there are applications for diaphragm pumps. The caveat is, what the exact application in the process remains a mystery. Exact processes remain a closely guarded secret as there are several technologies for extraction. The three most common types of extraction are CO2, Ethanol and Hydrocarbon. CO2 is the most difficult, but appears to be the purest form of removal. CO2 allows for the extraction of oil without leaving residual oils and the need for more processing. It is CO2, in fact, where we see the lion’s share of the pumps being sold. As previously stated, the intricacies of the application are still somewhat shrouded in mystery, but we do know that Stainless Steel and EPDM are the materials of choice. Stainless for it’s resistance properties and EPDM for its ability to operate down to -40 degrees. 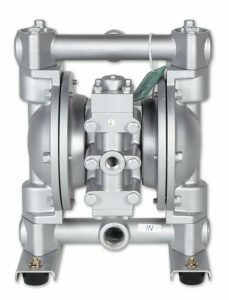 Both standard SS and FDA pumps have been used as well as NDP and Tri Clamp fittings. Lastly, the most common sizes that we have seen are the NDP-20 and NDP-25. For more information, visit www.yamadapump.com or call toll free (800) 990-7867. Tis the season, for beer! 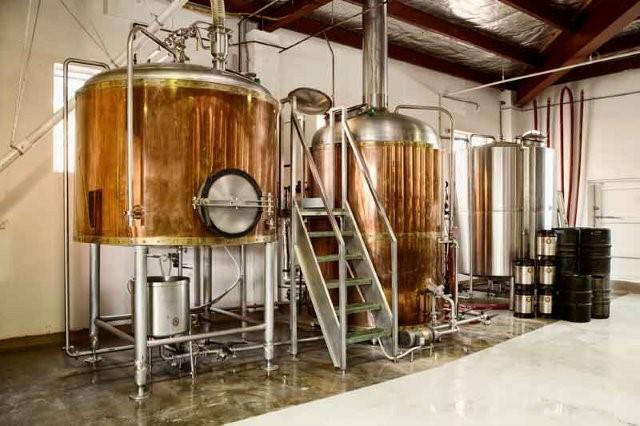 The craft brewing industry is one of the hottest markets in our current economy. With over 160 facilities just in the city of Chicago alone, it’s an industry worth spending some time on. It’s a 26-Billion-dollar market and each one of these facilities could use our SS FDA pumps. They are used on the final products as well as cleaning applications in the breweries. For more information on what’s going on in your area, go visit www.brewersassociation.org plus check out our literature specifically designed for breweries here. 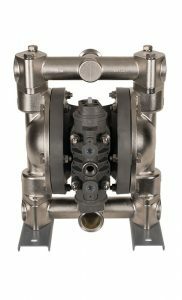 Yamada’s new DP-15 series metal pumps are designed to provide maximum performance, while maintaining the reliability that you’ve grown accustomed to. These 1/2″ pumps are perfect for spraying and dispensing applications, particularly when on and off cycling reliability is critical. The Yamada LLC-2Y Liquid Level Controller controls Yamada pumps to maintain preset levels. The LLC-2Y is a totally pneumatic system designed to automatically start and stop Yamada Air-Powered Double Diaphragm Pumps when the liquid level within a tank, sump, etc. reaches predetermined levels. An extremely versatile controller, the LLC-2Y can be used in both single and dual pump applications with any size or model Yamada pump. Yamada performance curves plot viscosity, temperature, total head, and air pressure requirements in easy to read charts. Filter Regulators are an excellent, low cost, easy install accessory that provides precise pressure control necessary to optimize the performance and efficiency of your Yamada air-operated double diaphragm pump. Yamada’s “in-the-field” approach has yielded an accurate, well-engineered ink pump in an easy-to-use, low-maintenance design. 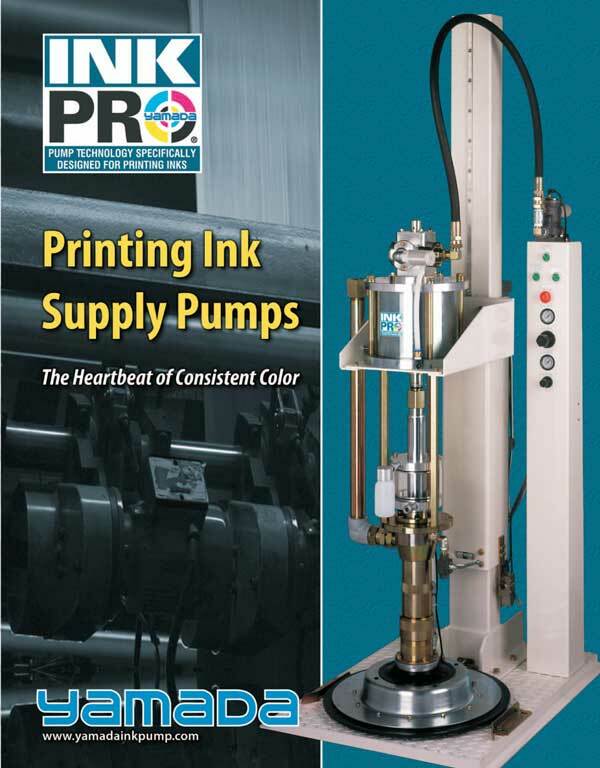 Yamada Corporation, a pioneer in pumping products for 100 years, developed the InkPRO® exclusively for the transfer of high viscosity printing inks. Other manufacturer’s products are designed for grease or spray applications and sell modified versions for pumping ink. Outside Accessible Air Valve –Yamada has developed the latest in air valve technology to insure that your pump runs longer and requires less maintenance than leading competitive brands. If air valve inspection is necessary, there is no need to remove the pump from service – remove two bolts, access your air valve and minimize your down time. Unique Inductor Plate –The transformable sealing system (U.S. patent no. 6,422,430) is designed to allow for very easy and clean drum changes. Oil Container–The visible plastic oil container protects against ink leakage (see through container), maintains a lubricated plunger, and extends gasket life. Lubrication maintenance is minimal. Low-Level Sensor–Easily adjustable pneumatic low-level sensor prevents pump dry running. Anti-Freezing Design–The high efficiency air valve is designed to reduce air consumption and cycling speed is optimized to eliminate freezing. Metering–Precision, high quality construction insures accurate metering. Less Noise –Quiet operation (less than 70dB within 3 feet) vs. competitive models. 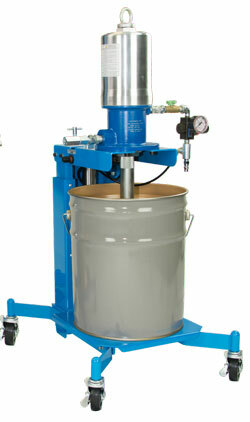 Yamada Corporation’s air operated SKR110 series lubricator is now available through Yamada America. Though commonly used in the automotive manufacturing industry, the SKR110 unit is used worldwide in many grease pumping applications. The SKR110 is portable and comes complete with a pump, airlift assembly, air regulator and inductor plate. 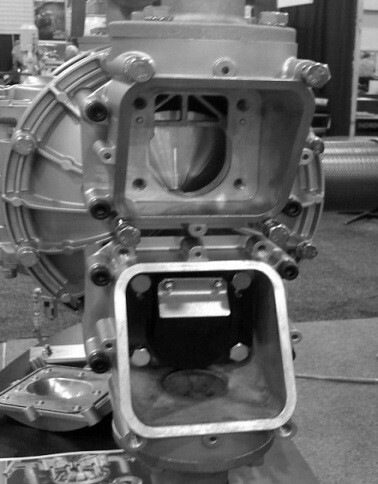 At a 50:1 pump ratio and operating pressure of 1500-5000 PSI, the SKR110 is capable of pumping grease up to NLGI No. 3, making this unit one of the industry’s most effective lubricators. Get literature. For more information call Yamada at (800) 990-7867.